1) Once the countertops are cleared off, the doors and drawer fronts are removed. Any repairs are then made to the cabinet box. In order to help the new plywood adhere to the cabinet box, holes are drilled into the cabinet fronts and sides. 2) The new 1/4" plywood is adhered to the fronts and sides of the cabinets and held in place with clamps and an occasional brad nail. All of the plywood, trim, doors, and drawer fronts come in your selected wood species, and pre-finished before installation. 3) Trim, doors, drawer fronts, and knobs or handles are installed. Options such as valences, shelves, pullout drawers, etc. can also be installed at this time. The materials used are the finest quality of select grade solid wood from the heart of the Appalachian hardwood country. All doors and drawer fronts are manufactured and finished with a craftsmanship that is second to none. 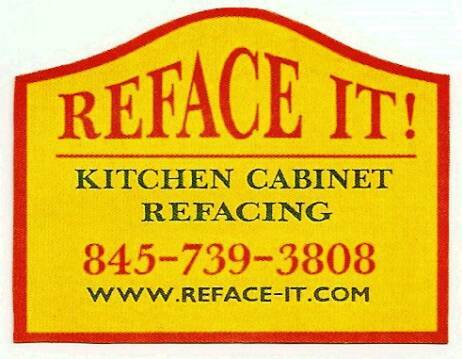 When the professionals at Reface It! are completed with the job, your kitchen will stand out as a work of art that you can be proud of! "We knew the cost of new cabinets would have been prohibitive. We also did not want to go through the mess and work of emptying all the cabinets. The quality of the work is first-class". "I was told about Reface It! by my neighbor, who's kitchen was done by them. I ended up having my kitchen cabinets refaced by them, along with new granite countertops, and a new tile backsplash. ..Very happy with the results!